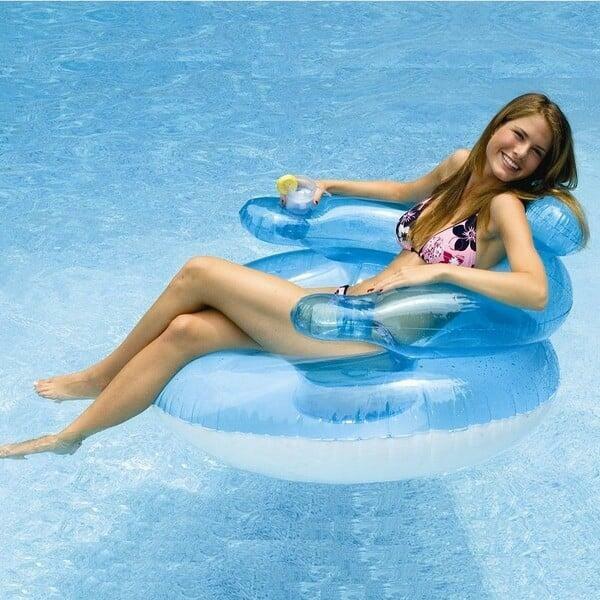 A Blue Translucent Pool Inflatable - Combine Bubbly Comfort & Bubbly Looks! With a comfortable air cushion experience and a translucent blue color, the BubbleChair from Swimline and Family Leisure combines bubbly looks with bubbly comfort. This inflatable pool lounge offers built-in cup holders, a pillow headrest and armrests. It's quite comfortable and functional. But be sure to purchase the sunblock along with the BubbleChair! Why? The comfortable nature and the convenient holders to place drinks allow hours to quickly zip by as you soak in the sun! And this Family Leisure pool supply comes with free shipping nationwide!